Business or pleasure? How about both! Bleisure is a mashup of business and leisure. Not too long ago, people separated their business trips from their vacations. Now, savvy travelers are extending their work-related travel so they can enjoy some free time before or after they conclude their business. Why has this new way of traveling emerged? Some say that it is the result of many workers seeing their hours and work demands increase. Even with advances in technology promising to make work easier, everyone seems to experience more and more work as a result. The temptation to blow off steam is greater than ever, and it makes financial and scheduling sense to sneak in some leisure time when possible. This is a new perspective on vacation travel, fueled by changes in the workplace. There was a time when blending business and personal travel was frowned upon. Even today, there are a few holdovers from this who would be upset if an employee extended a work trip to include some off-the-clock fun. The trend, though, is for employers to use bleisure travel as a work incentive. While the desire to blend business with leisure travel is prevalent in millennial professionals who may be in their 20s, the preference extends well into other generations and includes those in their 50s as well. With this broad demographic, it may seem daunting to try to target these travelers with marketing. The key is to know their online habits. Bleisure travelers are most likely to have holdover stays in major cities. The top cities for combining business and leisure include New York, Seattle, Los Angeles and San Francisco. Digital marketers should target business travelers in these areas, as well as regional areas that are attractive as side trips and are located close to major metropolitan areas. For example, business travelers in San Francisco may be tempted to hop over to nearby Napa Valley for the weekend and combine business with pleasure. Bleisure travelers search online for vacation deals, just like most of the rest of the population, although research shows that their online searches are much shorter in duration. This makes sense, as their business needs have already dictated the location and likely their hotel stay, so they are likely less flexible in some aspects of their trip like hotel, travel dates, or even preferred airline. Still, these travelers still spend about one to five hours researching trip options, so there is still ample opportunity for travel websites to capture their attention with targeted content or special offers. Bleisure travelers are also highly mobile and are often looking for deals, so they are prime candidates for retargeting campaigns. Since their time to make a purchase is condensed, marketers have a smaller window for influencing their decision. If you have a connection with your business travel accounts already, market directly to these travelers with things like add-on days and leisure packages to provide and incentive for continuing their travel experience. Leverage social media to bring a heightened awareness to reduced costs for a weekend layover, such as lower airfare for staying over past Saturday. To tap into the market that is not part of your current clientele, your brand should strive to be an expert voice on the attractions in your area. These travelers are interested in popular sites and dining in particular. They extend their stays to step away from their business and experience the culture that a city destination may offer, for example. Your travel-related content should match this theme and rank high on searches for "fun things to do" and "best restaurants" in your city or region. Research shows that business travelers are looking for these options, so don't lose the opportunity to provide these customers with the answer to their questions or solutions to problems. By providing weekender guides to your business customers, you will have given them an opportunity to act. Partner with apps and sitesthat offer deals for the last-minute travel shopper. Bleisure travelers often scour these sources. Their employer most likely footed the bill for their business trip, so they might not want to pay a high rate for their business-class lodging. Capture their interest in deals by offering reduced rates for a fourth or fifth stay on a visit that begins on a Monday or Tuesday – a clear sign of a business-related trip. 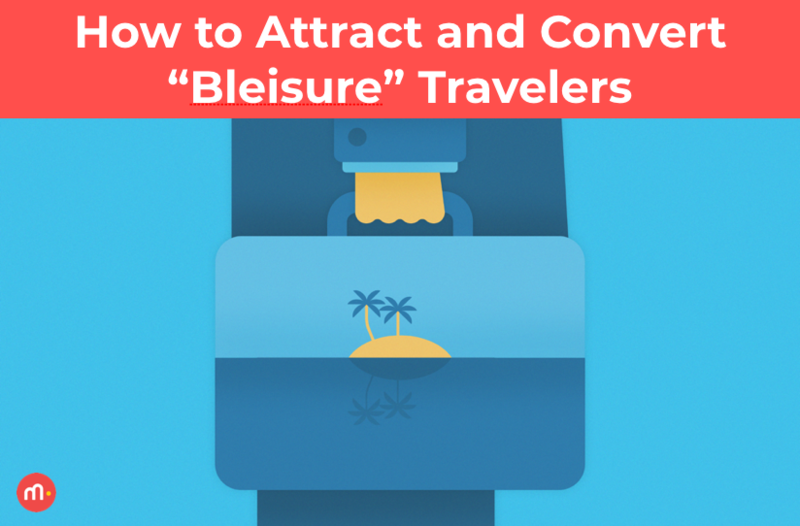 Need help with attracting and converting bleisure travelers? Give us a shout at optimization@multiplica.us!